Born: 1865, Paarl, South Africa. Richard A. Wilson, medical practitioner, was educated at the Diocesan College, Rondebosch and matriculated through the University of the Cape of Good Hope in 1888. Proceeding to Scotland he qualified as Bachelor of Medicine (MB) and Master in Surgery (CM) at the University of Edinburgh in 1893. After working as a locum tenens in Durham for six months he returned to the Cape Colony towards the end of 1893 and was licensed to practice in the colony on 4 December that year. At first he settled in Wellington, but soon moved to Cape Town as a partner of Dr William C. Scholtz*. The partnership lasted until Dr Scholtz's death. In 1895 Wilson married Agnes E. Goodsir, with whom he had three children. During the Anglo-Boer War (1899-1902) Wilson was appointed visiting medical officer to Woodstock Hospital, but was also the private medical attendant on Colonel Stowe, the American Consul-General. He was taken prisoner by the Boer forces in the Orange Free State, but subsequently released as a temporary American citizen. 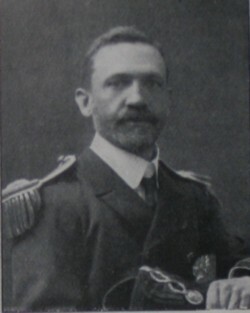 Around 1905 he became medical officer and lecturer at the maternity hospital in Bree Street, Cape Town, and was staff surgeon to the Royal Navy Volunteer Reserve from its inception. He served on the council for the prevention of tuberculosis, the parliamentary committee of the British Medical Association, and the local society for the second International Congress on School Hygiene. Wilson published two papers in the South African Medical Journal, "An interesting case of sub-acute nephritis" (1895) and "On the therapeutic uses of Ol. Ricini" [castor oil] (1896). With W. Cramer he also published "A criticism of some recent work on protagon" in the Quarterly Journal of Experimental Physiology (1909). He was a member of the South African Medical Association and the Cape of Good Hope Branch of the British Medical Association, and became a member of the British Association for the Advancement of Science in 1905. By 1915 he had moved to the island Guernsey. Pietermaritzburg archives depository, Vol. NMC 34: List of medical practitioners.... in the Cape Colony, 1915. South African Medical Journal, January 1898, Vol. 5, pp. 240-242, South African Medical Association [list of members].